Join Chris North and Edward Gomez as they discuss the month’s astronomy news. Not only were there two new NASA missions announced this month, but Space-X successfully returned to flight with their Falcon 9 rocket. Further afield, there are predictions of a pair of stars that are set to explode in a few years. Being January, the National Museum in Cardiff hosted its annual public event celebrating all things space. 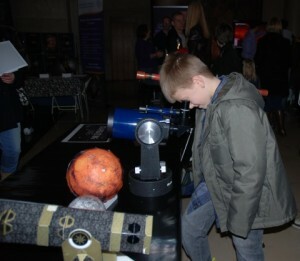 With exhibits, demonstrations and shows for all ages, several thousand people attended “Star Attractions” and get to learn a bit more about astronomy and space. While we were there with a stand from the School of Physics and Astronomy, Chris spoke to a few people who were there to find out what they got out of it. Originally broadcast on 30th January 2017 as part of Pythagoras’ Trousers on Radio Cardiff. This entry was posted in Media, Radio on January 30, 2017 by Chris North.